Eternally sheltered at the lotus feet of The Founder - Acharya of World wide Sri Gaudiya Math and Jagadguru Om Vishnupad Paramhans Parivrajakacharya 108 Sri Srimad Bhakti Siddhanta Sarasvati Goswami Thakur Prabhupada . The appearance of His Divine Grace Srimad Bhakti Kumud Santa Goswami Maharaja took place in the auspicious place related to the place of appearance of Srila Shyamananda and Srila Rasikananda, in the Medinapur district of West Bengal. He appeared mercifully on 2nd day of Baisakh of 1921 the first month of Bengali Calendar in the house of well-renowned astrologer, doctor and landlord, Sri Vaikunthanath Roy in the village "Narma". His mother Srimati Ratnamayi Devi was a devout lady absorbed in worships. He was the third and youngest son of his father and his name given by his father was "Radharaman". Usually he used to remain immersed in the worship of Sri Anantdeva and Sri Gopal dev, on contrary of passing time in playing as other children used to. By the divine planning of Lord Krishna, the stalwart disciples of Srila Prabhupada , like Bhakti Hridoy Bon Maharaja, Bhakti Promode Puri Maharaja, Bhakti Dayita Madhava Maharaja, could point out the para-normal attitude of the child, Sri Radharaman and got astonished at the same. His father also Sri Radha Madanmohanji, Sri Chaitanya Ashram, Behala Calcutta discussed with devotees about the possibility of the study of Sri Radharaman at the Sri math. When the devotees discussed this point with Srila Prabhupada , the latter readily allowed for the same. To see whether the child can adjust in the math, the eleven year child Sri Radharaman was taken to Sri math by his father. The child was attracted by the effulgence of divine lotus feet of Srila Prabhupada and showed his inclination to stay with him He was admitted to the New Indian School near Scottish Church College of Calcutta. During his study, he used to participate in the Kirtan and different programs of Sri math. His natural aptitude for Sankirtan and his sweet voice pleased Srila Prabhupada and the then Sannyasis. 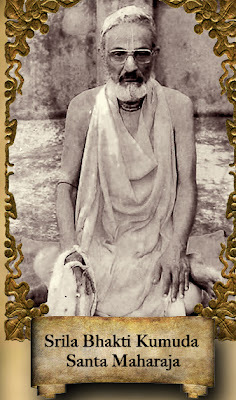 During his study he was given Sri Harinam. 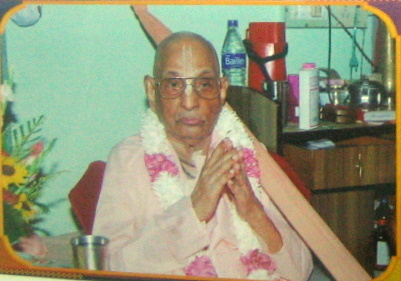 After the completion of the study at the school, he was sent to study Sanskrit by Gour Das Pandit, at Sri Mayapur. Srila Prabhupada organized a colossal spiritual exhibition from 3rd Feb to 17th March, 1930 at Sri Mayapur and engaged Sri Radharaman in different services in this. Pleased by serving temperament of Sri Radharaman, Srila Prabhupada gave him saffron dress on 20th March of 1930. Srila Prabhupada organized an unparalleled exhibition in Dacca on 6th Jan, 1933 for extending the Vedic knowledge to the mass public. 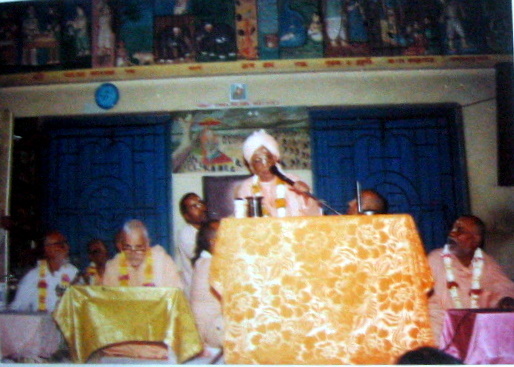 Having seen the unexpected capability of explaining the subject matter of the exhibition on the basis of scripture to the visitors, Srila Prabhupada was pleased at Sri Radharaman and sent him with Sri Srimad Bhakti Hridoy Bon maharaja for preaching program at several places of present day Bangladesh. Afterwards, Srila Prabhupada entrusted him with the responsibility of Sri Prapanna Ashram, located at Brahmanpara in the district of Howrah. Being satisfied by his efficient and single-handed management and preaching he was sent to Pai-Bareili, Shikarpur, Karachi, Pune etc. for disseminating Krishna Katha in Hindi Language. Sri Radharaman was sent by Srila Prabhupada to Burma for preaching on 8th March 1936. When Sri Radharaman was leaving for Rangoon, Srila Prabhupada came personally to see him off and he told him while adorning him with his prasadi mala "Dear Radharaman! You are crossing this ocean at a very young age. May Lord Krishna bestow His Mercy upon you". 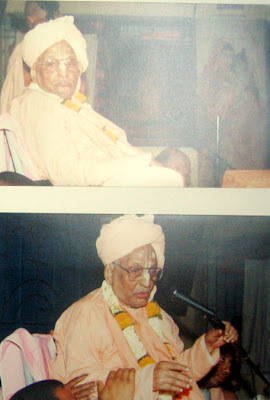 During his preaching at Mandalay, when he read Sri Chaitanya Charitamrita and came across the verse "Jivera Svaroop hoy Krishner nitya das", he was inspired to write an article "Guru dasatva hoy mor parichay". He sent this article to Srila Prabhupada for its publication in "Daily Nadia Prakash". After going through the article Srila Prabhupada was extremely pleased at the faultless content of the article, blessed Sri Radharaman and ordered Srila Puri Maharaja to print the same in the daily paper. Therefore, the word "Kumud" was latter on used in the sannyas name of Sri Srimad Bhakti Kumud Santa Goswarni Maharaja. Srila Prabhupada installed the Sri Vigraha in Gaudiya Math., Madras on 23rd Jan, 1932. After the completion of Sri Navadwip Dham Parikrama, Srila Prabhupada sent Sri Radha Raman Das to Madras for preaching, with Sannyasis. But, on 1st Jan 1937, at 5.00 a.m., Srila Prabhupada left his disciples drowned in the ocean of separation and distress at Sri Gaudiya math. Baghbazar, Calcutta. This news aggrieved Sri Radharaman, he left Madras at once and returned to Calcutta with Srila Bhakti Dayit Madhav Maharaja and from there went to Sri Chaitanya Math Mayapur. 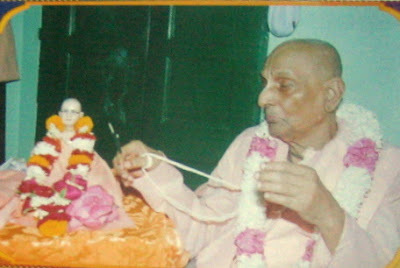 After the demise of Srila Prabhupada , Sri Radharaman travelled extensively and had darshan of different pilgrimage with Srila Bhakti Bhudeva Srauti Maharaja. 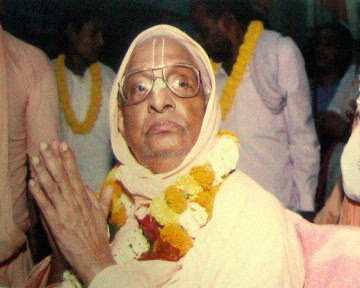 After the completion of Tirthatan, he went to his native place and started austerity and bhajan near the temple of Sri Sri Radha Kishori Mohan Jiu. During this time Srila Prabhupada appeared in his dream and ordered him to accept the renounced order of life and preach the teachings of Lord Chaitanya. 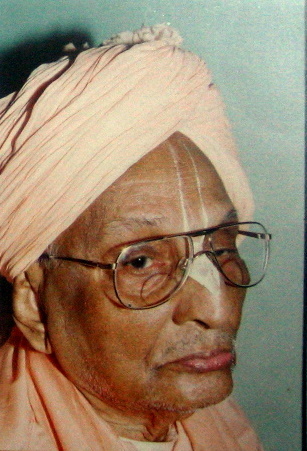 Following the order of his spiritual master, Sri Radharaman Das took Sannyas from Srila Bhakti Vichar Yayabar Maharaj at the auspicious premises of Lordship Sri Sri Kshira Chora Gopinathji, at Remuna on 12th Feb, 1942. He was named as Srimad Bhakti Kumud Santa. 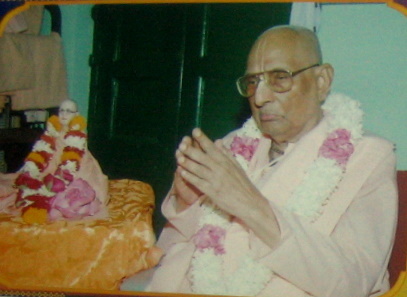 For continuous 32 years, he preached throughout India and directed the Mayapur Navadwip Dham Parikrama along with Bhakti Vilas Tirtha Maharaj. 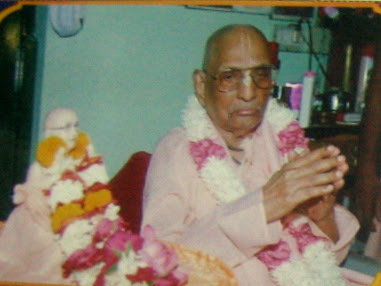 He rendered the service of offering melodious bhajans and eloquent lectures for the pleasure of Vaishnavas which is still remembered by the senior Vaishnavas. His Divine Grace inspired the souls to take darshan of Holy places by organising spiritual tour programs, in which he used to outline the importance of such places elaborately. He went abroad in 1975 for propagating the timeless teachings of Srila Prabhupada and inundated the countries like Great Britain, West Germany, Switzerland, Austria, Holland, Belgium with the same. 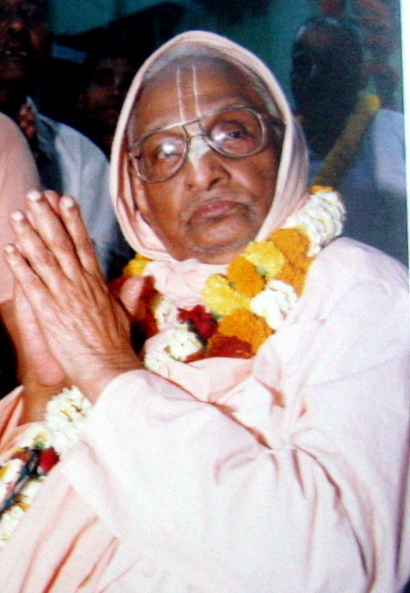 He installed his loving Deities Sri Radha Gopinath, Sri Sri Radha Govindji and Sri Radha Madanmohanji resp. at Sri Gauranga Math. 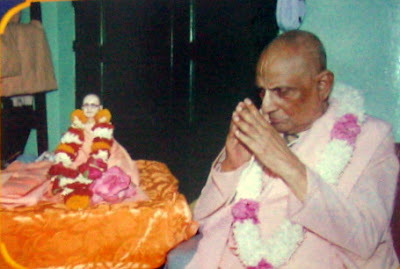 Kesiary, Sri Chaitanya Ashram Kharagpur and Sri Chaitanya Ashram Behala, Calcutta. They are being served with utmost devotion by him and his disciples. Later on, due to the repeated loving insistence of his disciples, he started Sri Chaitanya Ashram Puri where the deity is called Sri Radha Raman after his Brahmachari name. 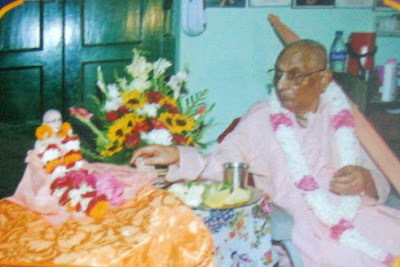 At Chheketi, located in uttar 24 parganas, Sri Sri Radha Madhav Ji is served with love in Sri Gaur Saraswat Sant Gaudiya Math. His service to the Vaishnava literature is also worth - appreciating contribution for the vaishnava as well as entire humanity. His books like "Samlape Shiksha", "Patre Upadesh", "Geeta Siddhant Sar", "Sant Vani", "Sri Gauranga Mahaprabhur Jiveni", "Sadhan Kan", "Damodar Vrat Mahatmya", "Bhakti Geeti", "Diksha" have been casting divine light on the royal path of pure devotion. Besides these books, he translated into Bengali a few books which "Moh mudgar" and "Moh Kuthar" are important. Starting from the tender age of 11 years, he has now completed his 87 years at the lotus feet of Srila Prabhupada , serving incessantly Sri Guru and Gauranga, Vaishanvas and entire world. Therefore, on this auspicious occasion of the appearance day of our most reverened Srila Guru Maharaja, we pray at the lotus feet of Srila Prabhupada that he please keep his glittering lamp burning for a long long time, so that souls like ourselves, engrossed in darkness, may get light for proceeding in the ultimate path of devotion.